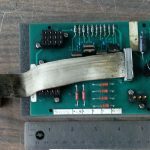 The results of this “mini-explosion” are a burned ribbon cable and connector and a burned pcb. Not to mention the dreaded down-time. This sounds ominous and it did look pretty bad. But yes! This ISO board WAS repairable! The capacitor was bad and five transistors shorted, all of which were replaced. Damaged traces were also repaired. The connector was damaged beyond repair however, so the ribbon cable was hard soldered directly to the circuit board to make the final repair. This type of repair is acceptable in many situations and saved our customer a great deal of money and time.This tiny troublemaker is back in the tooling shop. Need Charmilles repairs? 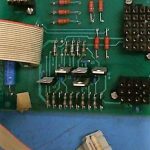 Got a damaged circuit board that needs repairs? We can help. About the Author: ACS Industrial is an independent, third party industrial electronic repair center providing repair services for controls of all types and most all manufacturers as well as servo drive repairs, AC/DC drives, VFD drives, servo motors, encoders, printed circuit board repairs, monitors and touchscreens, PLCs, test equipment, light curtains, and much more. Our customer service team is available to answer your questions and help solve your industrial electronic repair concerns. Legacy equipment can be repaired! RUSH Service is available. You can reach them by calling 800-605-6419.